Winston Churchill looks pleased with himself - dressed in civvies astride a horse. And, he probably has every right to be, after making a daring escape from Pretoria to Lourenco Marques, now Maputo, at the height of the Boer War. "A unique photograph of Churchill after he had escaped from Boer captivity, surfaced in the Sunday Times"
Farm tours at Summerhill Stud and Hartford House are popular items. Students of history, fans of racing and those who are mesmerized by the Midlands and the mystique of our sport, travel from as far afield as Johannesburg for the day, take in the tour and a bit of lunch at the nation's Number One restaurant, before they are back on the N3 northbound. Others prefer to do it the leisurely way, and they check in for a couple of nights at Hartford. While we'd recommend the latter for its relaxation, we'd not want to deny you the pleasure, either way. If you've done the tour, you'd know that in the summer of 1899, a young Winston Churchill was a visitor to the Moors of Hartford. We all know too, of his capture up the road from us, and his presence at the mother of all battles, Spioenkop. Remarkably, on Spioenkop that day (just 45 minutes from us,) and drawn together by dint of the peculiar attractions of our region, were five of the most influential people of the 20th century. Louis Botha, the first Prime Minister of South Africa, (who together with Hartford'sSir Frederick Moor and his brother, John (the former a colonial Prime Minister, and the latter a senator in the first South African government, attended a class of just 10 students at Hermansburg Junior School;) Denys Reitz, former Deputy Prime Minister of South Africa and later a Field Marshall in the British army, he was there; our man, Jan Smuts, the man the world chose to write the charters for the League of Nations and the United Nations after the respective World Wars, and the man Churchill appointed as his successor in the war cabinet should anything have become of him, he was there. In the pantheon of great South Africans, you'd have Smuts up there with Nelson Mandela, who ironically was captured just to the south of us seventy two years later; Winston Churchill himself, later to become Prime Minster of England and arguably the greatest Englishman of all-time, he was on Spioenkop that day; and amazingly, the man who liberated India in 1947, Mahatma Ghandi, was there as a stretcher bearer. Just recently, a unique photograph of Churchill after he had escaped from Boer captivity, surfaced in the Sunday Times. It's apparently coming up for auction in England shortly, and there's been a bit of a story about it. 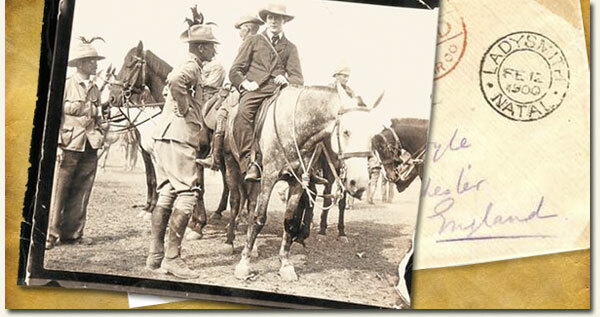 It turns out the picture was taken in our immediate vicinity, after Churchill's escape from Boer custody. From 1896 to 1897 Churchill served as a soldier and journalist in India. In September 1898 he fought at the battle of Omdurman in Sudan, taking part in what is often described as one of the last true cavalry charges. In 1899, he resigned his commission, and was assigned to cover the Boer War for the London Morning Post. In October that year he accompanied a scouting expedition in an armoured train near Ladysmith, in what was then Natal, but was captured by the Boers. Although he was a war correspondent, he was armed with a pistol when captured, so was treated as a prisoner of war and held in what had been the Staats Model Skool in central Pretoria. Churchill managed to escape, and the Boers put a £25 price on his head. Travelling by foot and train - where he hid under coal sacks - he eventually reached safety, 480km away, in Portuguese-controlled Lourenço Marques. The escape made him a celebrity back in Britain and he was elected to parliament in 1900.